Whether or not director Akira Kurosawa felt the impact of American Westerns, the Western would feel the impact of him. In an increasingly interconnected world it becomes not only more difficult but also useless to distinguish the influenced from the influential. Whether or not director Akira Kurosawa felt the impact of American Westerns, however, the Western would feel the impact of him, as would any action movie that ever followed his masterpiece, which can be blamed or credited for virtually every slow-motion action sequence you’ve seen. The saga of seven nomadic ronin who come to the aid of a small farm village beset by bandits—if that sounds like the same story as 1960’s The Magnificent Seven, you’re starting to get the idea—this three-and-a-half hour epic electrified the world, and 60 years hasn’t bettered its template. 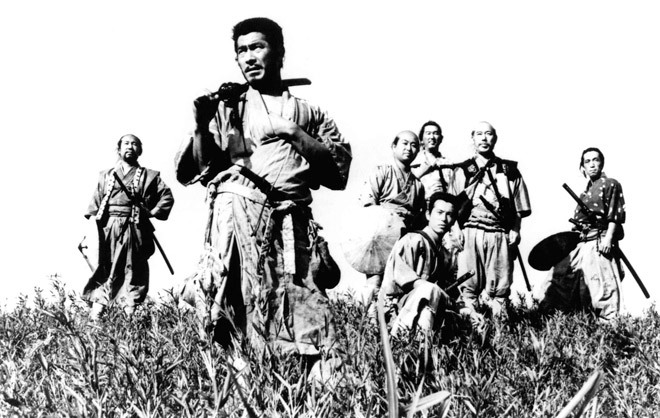 Seven Samurai was the biggest movie the Japanese film industry had seen until that time and, in what Essential Movie Library readers will begin to recognize as a pattern, the studio believed it had a disaster on its hands. Cast and crew were pushed to the edge of tolerance by the shoot’s punishing conditions, and on the film’s release the local critics weren’t all that overwhelmed either. But filmmakers since have bowed at its shrine, including Steven Spielberg for whom watching Seven Samurai is a ritual before he makes a new picture. The final storm-racked battle is a ballet of carnage, silver swords slicing the air in competition with the glassy slivers of rain, loose-cannon warrior Toshiro Mifune taking his position on the knoll where, racked by doubts of his worth and haunted by prospects of heroism, he achieves nobility and redemption.